Albania, Austria, Belarus, Belgium, Bosnia and Herzegovina, Bulgaria, Croatia, Cyprus, Czech Republic, Denmark, Estonia, Finland, France, Germany, Gibraltar, Greece, Hungary, Iceland, Ireland, Italy, Latvia, Lithuania, Moldova, Montenegro, Netherlands, Norway, Poland, Portugal, Republic of North Macedonia, Romania, Russia, Serbia, Slovakia, Slovenia, Spain, Sweden, Switzerland, Turkey, Ukraine, United Kingdom. This is a political map of Europe which shows the countries of Europe along with capital cities, major cities, islands, oceans, seas, and gulfs. The map is a portion of a larger world map created by the Central Intelligence Agency using Robinson Projection. You can also view the full pan-and-zoom CIA World Map as a PDF document. Check out the terrain of the continent with this physical map of Europe. At a glance, you can see many mountain ranges; for example, the Pyrenees, the Alps, the Carpathian Mountains, and the Scandinavian Mountains. The Ural Mountains in Russia, along with the Caucasus Mountains between Russia and Georgia/Azerbaijan, are two mountain ranges which serve as physical landmarks showing approximately where eastern Europe meets western Asia. Google Earth is a free program from Google that allows you to explore satellite images showing the cities and landscapes of Europe and the rest of the world in fantastic detail. It works on your desktop computer, tablet, or mobile phone. The images in many areas are detailed enough that you can see houses, vehicles and even people on a city street. Google Earth is free and easy-to-use. Europe is one of 7 continents illustrated on our Blue Ocean Laminated Map of the World. This map shows a combination of political and physical features. It includes country boundaries, major cities, major mountains in shaded relief, ocean depth in blue color gradient, along with many other features. This is a great map for students, schools, offices and anywhere that a nice map of the world is needed for education, display or decor. If you are interested in the geography of Europe, our large laminated map of Europe might be just what you need. 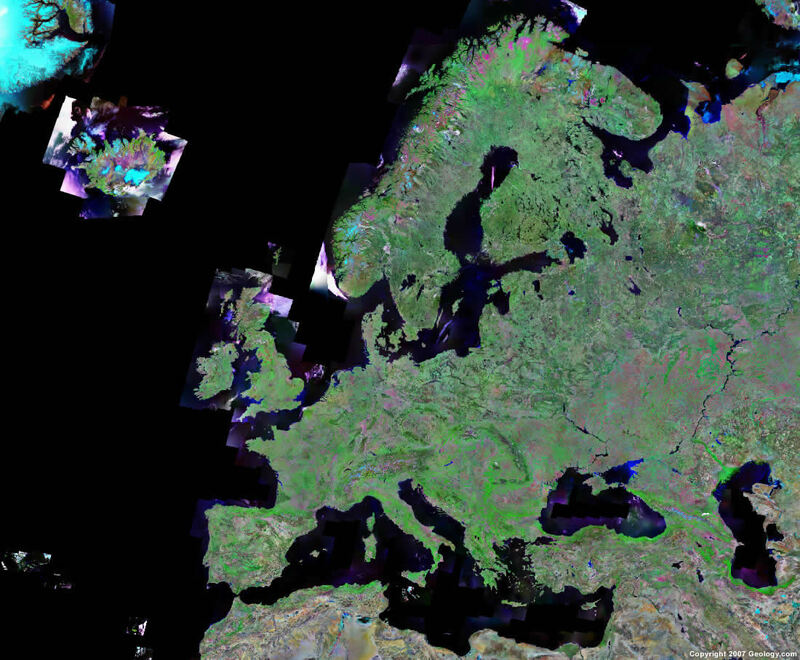 It is a large political map of Europe that also shows many of the continent's physical features in color or shaded relief. Major lakes, rivers, cities, roads, country boundaries, coastlines and surrounding islands are all shown on the map. Europe is a continent located north of Africa and west of Asia. It is bordered on the west by the Atlantic Ocean, on the north by the Arctic Ocean and on the south by the Mediterranean Sea. Amsterdam, Belgrade, Berlin, Bern, Bratislava, Brussels, Bucharest, Chisinau, Copenhagen, Dublin, Helsinki, Kiev, Lisbon, London, Madrid, Minsk, Moscow, Oslo, Paris, Podgorica, Prague, Riga, Rome, Sarajevo, Skopje, Sofia, Stockholm, Tallinn, Tirana, Vienna, Vilnius, Warsaw and Zagreb. Europe's fossil fuel, metal and industrial mineral resources have been heavily exploited for centuries. Please see specific countries for details of their resources. Europe has a wide range of natural hazards. Please consult the hazards list for specific countries. Europe has a wide range of environmental issues. Please consult the environmental issues list for specific countries.